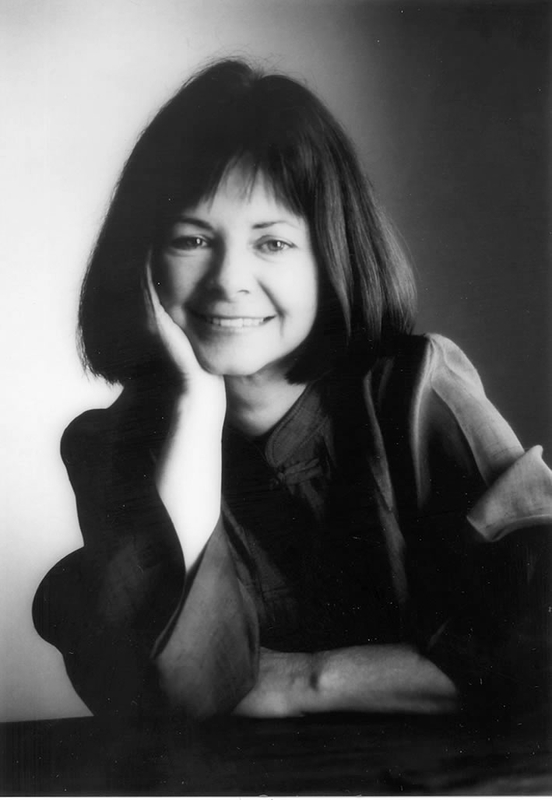 Geraldine Brooks: Geraldine Brooks was a reporter for The Sydney Morning Herald, and, after winning a Greg Shackleton Memorial Scholarship, she completed a Master’s degree at New York City’s Columbia University Graduate School of Journalism in 1983. The following year, in the Southern France artisan village of Tourrettes-sur-Loup, she married American journalist Tony Horwitz. As a foreign correspondent for The Wall Street Journal, she covered crises in Africa, the Balkans, and the Middle East, with the stories from the Persian Gulf, which she and her husband reported in 1990, receiving the Overseas Press Club’s Hal Boyle Award for “Best Newspaper or Wire Service Reporting from Abroad.” In 2006, she was awarded a fellowship at Harvard University’s Radcliffe Institute for Advanced Study. Brooks’ first book, Nine Parts of Desire (1994), based on her experiences among Muslim women in the Middle East, was an international bestseller. Foreign Correspondence (1997) won the Nita Kibble Literary Award for women’s writing. Her first novel, Year of Wonders, published in 2001, became an international bestseller. Her 2005, March, won the Pulitzer Prize. She followed this win with the book that she started writing before March was conceived, People of the Book (2008), which won Australian book awards. Most recently, she published Caleb’s Crossing (2011), and she is currently working on completing a new novel for Viking, titled The Secret Chord, which will be published September 2015. March: Mr. March enlists with the Union as an army chaplain at the early stages of the Civil War. He nearly dies at the battle of Ball’s Bluff, while crossing the Potomac with a buddy, but manages to survive, and despite his glum memories from the battle, he writes a bright and cheerful letter back home to his wife, Marmee, saying that he is missing his four daughters. He continues on his journey and enters the Clement estate, which he remembers seeing before in his youth, when he worked as a peddler of books and trinkets. He had befriended and kissed a literate slave back then, Grace, who is still with the estate, despite the fact that most of the slaves from that estate fled when the Union troops invaded. March is then assigned to set up a school at a liberated plantation, Oak Landing, where he is wounded and sent to a Washington hospital to recuperate, where he is met by his wife, but only manages to return home a good while later and by that point he is considering making a life with Grace and in fighting for the liberated blacks, instead of going back after all the trauma he suffered in the War. This historical novel is based on the lives of the characters of Louisa May Alcott’s iconic American Civil War novel, Little Women. 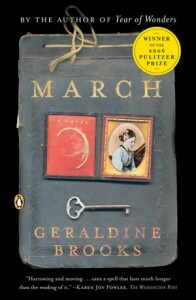 Mr. March is the father that leaves the “little women” alone to struggle through the War; but, in this project, Brooks focuses on the father and on his experiences in the war, as opposed to on the struggles in the women that have to fend for themselves. The author’s “Afterword” describes the varied primary and secondary sources that Brooks used to bring authenticity and historical accuracy to the book, while letting her imagination fill in the gaps history has left unwritten. Faktorovich: In your essay, “The Writing Life” you explain that as you started writing your first novel, Year of Wonders: A Novel of the Plague, you were working on developing elements in your writing that reflected, “The bright shards of Dryden and Pepys, the vast swathes of Shakespeare lodged in my memory…, the cadences, the rhythms.” Many Pulitzer Prize and otherwise highly critically acclaimed contemporary novels have these musical or rhythmic elements. Here is an example from a random page in your novel, People of the Book: “As Carnivale drew closer, his wife, knowing the danger, had gone through his box, searching among his clothes for the mask and cape that would make him indistinguishable from a Venetian Gentile” (160). The four commas in this sentence are almost measuring a beat. There is also a complexity in this average sentence that has a melodic, wave-like quality, which goes in circles, instead of plowing forward to the next action. Can you explain if you are consciously measuring out a meter or a rhythm as you write? Are you listening to measured music that is unconsciously setting this rhythm? Does your editor go through and add this complexity, or ask you to make plain sentences more musical? Most ambitious writers can benefit from understanding the mechanics of this rhythmic quality. Brooks: I don’t do any of this consciously. I try to do normal writerly things, such as varying sentence length; using abrupt diction to express haste and confusion, more leisurely and musical passages to evoke times of thoughtfulness or reflection. Faktorovich: One of the techniques you employ in the Pulitzer Prize winning novel, March, that you don’t do as often in your other novels, is the use of violent action descriptions at the start and end of your chapters, and cliff hangers at the end of chapters. For example, after opening with a passionate letter Mr. March writes to his wife at the start of Chapter One, he jumps into a battle and ends up in a river, swimming across amidst flying bullets. You don’t focus on the fire exchange during the battle because Mr. March is the chaplain and isn’t actively firing, but you do have his friend grip his fingers around his throat after he’s hit and then tear at this hair and thumb his eye after he’s hit and is dying. The more close-contact battle in the river with the friend is more emotional and has more detailed violent elements that seeing men firing at each other long-distance. Did you consciously insert these scenes of emotional violence and cliff hangers to keep the readers’ interest? An example of a cliff hanger at the end of that chapter is when Mr. March sees a house he recognizes, but it is not revealed why it is familiar until the following chapter. Do you think that the Pulitzer Prize committee responded more favorably to this book because they enjoyed reading it due to these elements? If not, what do you think makes this project stand out as exceptional amidst your novels? Brooks: I disagree that March is unique in this way. I think all my novels employ these elements. The lynching scene in Year of Wonders is very violent for example; People of the Book, which also is partly set during wartime, has intense scenes of conflict and suspense. Having now served on the Pulitzer committee myself, I can say with some authority that I have absolutely no idea why they chose my book. All prize committees are subject to the tastes and impulses of their particular judges, who are usually well-meaning, but under vast pressure to read an inhuman amount of literature in a short period. Second-guessing these decisions is an exercise in futility. Faktorovich: You’ve mentioned in your “Afterword” that you used a similar voice for the character of the southern literate slave girl, Grace, as Harriet Ann Jacobs’ 1861 autobiography, Incidents in the Life of a Slave Girl, Written by Herself, which has been identified as having been ghostwritten by the editor of the book that re-interpreted Harriet’s account in more literary language. Many writers, from Dickens to Twain, have used the contraction, like the ain’t and tol’ you use in Chapter One of March, to signify a poor or an ethnic character. You have also mentioned that you have wanted to introduce more Australian voices into your novels, but have only managed this in The People of the Book. What are the challenges and rewards of using linguistic elements like contractions, regional slang, or accents in novels? Do you think they have to be used in moderation to make a novel more appealing to a general audience? Brooks: I don’t think scholars are by any means unanimous regarding the Jacobs authorship. My personal belief is that the scholarship calling her authorship into question is based on racist assumptions. As I also pointed out in the afterword, I followed conventions of the period in rendering direct African American speech, because March is the narrator and therefore a man of that period who would likely have been influenced by prevailing conventions. More broadly, I think the search for authentic words of the period is crucial to creating a sense of authenticity. I say “a sense of” advisedly, as if the novel were to be written in an entirely authentic archaic idiom or dialect it would risk becoming impregnable to a modern reader. Faktorovich: You also employ the rollercoaster device regularly in the March. For example, in Chapter Two, you begin by writing that Mr. March had acquired the trinkets he wanted to sell on the road as a youth with pride, but then drop his spirits by saying that he later learned that they had been worthless. Mr. March fails to sell most of them, and this sets the scene for his desperation, which makes it necessary for him to stay at the Clement estate, which he only leaves when he’s kicked out for teaching a slave to read. In other words, Mr. March begins his sales career with cheer and joy, then these hopes are dashed as he fails at it, and then his spirits are picked up by the opportunity of working for the Clements, but are dashed again, forcing him back out onto the road in greater poverty. This is a clear rollercoaster plotline, which succeeds in keeping the reader on their toes. Do you think modern readers need this rhythmic climb and lowering of happiness and expectations? Does a story seem more correct to critics when it has these ups and downs? Do you consciously try to rhythmically shift the main character’s mood from sad to happy to sad? Brooks: He stays with Clement because of the library and the chance for intellectual stimulation. It’s necessary to present a protagonist with challenges throughout the development of the plot, otherwise there is no plot. Faktorovich: In “A Conversation with Geraldine Brooks”, Penguin’s editor asked you why you created a “romantic relationship between Grace and March”, and you said that there were no historical hints to this in the biography of the man you based the character on, Bronson Alcott, but that they were both “young and attractive” and the relationship was “dramatic and moving”. Do you think there is pressure, in contemporary fiction, to portray love relationships or flirtations between most characters of opposite genders? For example, when Mr. March enters the Clement household, he first flirts with Grace, and then is heavily flirted with by the mistress of the house, Mrs. Clement, who calls him “handsome” and “‘the golden lad’”. It seems no chance for sexual tension between the opposite genders is missed. It seemed to me that there were fewer of these sexual attractions in People of the Book and Year of Wonders, and both of these sold very well to the general public, but didn’t win a Pulitzer. Do you think critics are more sensitive to the presence of emotional and sexual triangles and entanglements, so that a book is more likely to win an award if these are present? What are your opinions, in general, about building love stories or anti-romances in novels? Grace rejects Mr. March at the end, so you avoid the formulaic happy ending to a sexual tension that is reciprocated at the beginning between Mr. March and Grace. So, why not just avoid sexual tensions all together in the year that March spends away from home, focusing on the politics or military history? Brooks: I couldn’t disagree more. Year of Wonders has two illicit relationships at its very core. The modern protagonist of People of the Book is sexually reckless in the extreme. Caleb’s Crossing is one long essay on powerful unrequited sexual attraction. I write about romantic and sexual relationships because I’m writing about human beings; living people with blood and sperm and a physical life. It’s absolutely absurd to suggest that I could have created a rounded, plausible character in March who has no emotional, romantic or sexual self. I don’t know why you would even suggest such a thing. Where in literature is this sexless character? Faktorovich: In the “Afterword” to March, you write that among other sources you looked at “sixty-one journals” and “thirty-seven manuscript volumes in the Harvard College Library” when researching Bronson Alcott’s life. How long did it take you to look through those materials? Did you photo copy or digitize these materials to review them later at home, or did you read them at the Library? Did they give you a private room to read in or were you reading amidst the noise, shuffling of the main floor, or in an archival room with all the other researchers turning pages? Did you do more archival research for this project than for other books? Do you frequently use the Harvard libraries, or just in this special occasion? Did you consider choosing a character that was more popularly known and that might have had volumes of his biography available at your local library? The cover of the newer edition of March that Penguin sent to me has a scan of a fragile archival diary cover on the front and back covers, suggesting that the book is a first-person diary narrative, and it is indeed written in the first-person. Do you think archival research is a part of the detective work that great writers have to do to present new research wrapped in the fancy wrapping of a novel to the public? Is archival research a public service that writers do to enrich readers’ minds and educate them without preaching or lecturing? Brooks: I love archival research. For March, I was merely basing my character on Bronson, so I did not need to peruse every word he wrote as I would were I doing a scholarly biography. I merely read enough to hear a voice that allowed me to imagine as complete as possible a character of a Victiorian transcendentalist-idealist-radical. I used Library of Congress as well as the Harvard Libraries, but I was able to purchase second-hand volumes of his letters and an abridgment of his journals, which I had at hand to refer to whenever my sense of my character’s voice weakened. Faktorovich: Ralph Waldo Emerson and Henry David Thoreau are minor characters that appear briefly in March, were you tempted to focus more on them and to include asides that depicted the details of the lives and philosophies of these great and recognizable geniuses? Wouldn’t bringing in recognizable generals of Union or Confederate troops or more literary giants have brought a more historically engaging sub-layer to the story? Or did you consciously avoid focusing on historical giants to make the story more personal, and less political? Brooks: I let the needs of the story dictate who made appearances. They are there because their interactions with my fictional characters provide a way to illuminate those characters, and advance the plot. Faktorovich: Do you know which printer does Penguin use, and is that printer available for orders from other publishers? I’ve always admired the paper and cover quality of Penguin’s books. I especially like the gold specks and letters on your covers. The designer also did a great job fancifully handwriting the titles of the chapters in March. And I love the map illustration in People of the Book. Out of the four books of yours that Penguin sent to me for review, two of them had covers designed by Jaya Miceli: Caleb’s Crossing and People of the Book, and both of these had front-matter maps of the regions covered in the books. Do you have any control regarding who will design your books with Penguin? Do they use freelance designers, or is there a small group of full-time designers that design all of Penguin’s books? Is there one illustrator that specializes in making maps, another that scans and edits archival documents, and another that does hand-written chapter title names? As a designer, I’m curious about these practical matters. Brooks: I think you need to investigate this with Viking. I make suggestions but don’t have a hands-on role. Faktorovich: In the “Afterword” to March, you thank your agent, Kris Dahl. When did you begin working with Dahl? Did Kris help you sell your first fiction or your earlier first non-fiction book? Did you sell your first bestseller yourself, and then get interest from an agent, once you were a sure-bet. What came first, the agent or the big sale? Did you begin by working with a smaller agent and then switch to Dahl, or have you worked with Dahl from the beginning? In general, what is your advice to starting writers regarding agents and why they are essential in the writing profession? Brooks: When I was a newspaper correspondent, an agent approached me. He wanted me to turn a particular article I’d written into a book. For various reasons the idea he pitched wasn’t viable, but it did lead me to write my first, non-fiction books, which he agented. I have been with Kris Dahl at ICM for all of my fiction, which is now a relationship that spans a decade and a half. My advice to beginning authors is to look for books that have been successfully published that are close in spirit or theme to what you wish to write, check the acknowledgements and see if the author mentions an agent by name, and then pitch to that person, referencing the book and explaining why you feel your work is similar. Faktorovich: You’ve mentioned that you disliked participating in “midsummer reenactments” with your Civil War aficionado husband, Tony Horwitz. Can you describe one of these from your perspective? Did you stay in the tents, or in the car, while your husband engaged in the “fighting”? Did you put on a Civil War outfit for it? Are there a lot of women that participate in those? Did you use bug repellant? I’m curious to read a description of the event from your perspective, as most portrayals of these usual come from those who love those gatherings. Brooks: I wasn’t really involved in this, but I did host some re-enactors who liked to stay in our antebellum barn when we lived in rural Virginia. The best of them were very committed, serious people who see themselves as living historians and strive for authenticity, meaning they don’t take part in simulated battles, because these by definition are inauthentic. They tend to reenact marches, drills and camp life, which comprise, after all, the majority of the way a common soldier spends his time. Faktorovich: In another interview reply, you say that you wrote March “against the tumult of my own feelings about the war with Iraq…” What are/ were your feelings about the ongoing war with Iraq? You made a journalistic career on working in war zones, so I don’t know if it’s obvious to your readers if you are for or against justifiable wars. You have said that you have avoided writing about the wars you witnessed because you feel as if you are too personally wrapped up in those events to view them from a creative distance. March isn’t unbearably shell-shocked in March, though of course he is pretty traumatized and depressed; still it seems you are keeping an emotional distance here towards war. So, maybe you can elaborate about your views and feelings regarding war in general, and the Iraq war in particular? Aren’t you “romanticizing” the American military when you write in a rhythmic and melodic language about the Civil War? Brooks: There’s nothing romantic about war. I feel I have written plenty about it as a news correspondent and believe me, there’s no emotional distance. I feel war is a blunt and terrible instrument that rarely achieves its intended ends. However, it is easy to seek the hot satisfactions of a violent response when one witnesses atrocities, genocide and human rights abuse on an industrial scale. This was true for the Civil War and it was true for many who witnessed the long brutality of Saddam’s genocidal wars against Kurds and his ruthless oppression of dissidents. However, I don’t think anyone anticipated the fecklessness of the Bush administration’s approach to the Iraq war and its aftermath, nor did many people realize, at its outset, the dreadful toll that the Civil War would exact. Faktorovich: Wikipedia says you have two children, but Penguin’s bio says that you only have one child… How many children have you produced? What is he up to these days (I believe you’ve said you have a son, who should be seventeen by now)? Is he finishing high school in Martha’s Vineyard or in Sydney? Brooks: My eldest son, Nathaniel, is 18 and is a freshman at Harvard. My younger son, Bizu, is 12 and he is in the sixth grade at public school on Martha’s Vineyard. Faktorovich: Do you have any general or specific advice for writers that want to write a Pulitzer Prize winning literary novel? What are the key ingredients to achieve this success? What should they avoid? What techniques or habits have worked for you over the years? Brooks: You can only write the best work you are capable of on any given day. If someone does you the honor of reading it, then that’s more than enough. Faktorovich: What are you working on now? Is there a novel that’s nearing completion, and if so, can you give us a glimpse into its contents or summary? Brooks: The Secret Chord will be published by Viking in September 2015. It’s an imagined account of the life of David, told by Natan, who is the “prophet” in the Bible that acts as the keeper of the King’s conscience. Faktorovich: Thanks for participating in this interview!